Planet of the Apes is a 2001 film directed by Tim Burton and based on Pierre Boulle's novel and a remake of the 1968 film of the same title. United States Air Force astronaut Captain Leo Davidson (Mark Wahlberg) accidentally opens a portal to another world inhabited by talking human-like apes who rule the planet with an iron fist. 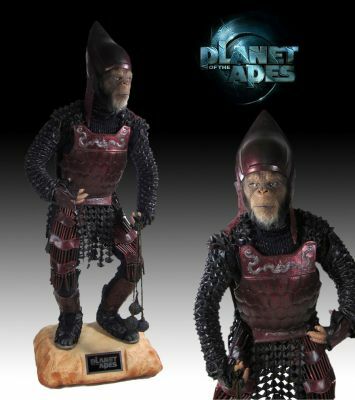 This is a complete screen used Warrior Chimp costume with all leather and fiberglass components making this a more â€œfeaturedâ€ chimp instead of a background actor. Both the masks and costumes were made differently considering if they would be closer to the camera or further away where the details could not be seen.